First thing – I want you to know that unlike allll of the other Ollie swaddle reviews on Google, this is NOT a sponsored post (which means I am not getting paid or getting a product from Ollie to write it). I received an Ollie swaddle as a gift from my sister for my first child, and I purchased a couple more (at full price) for my second child. And lemme tell you..they certainly aren’t very cheap. I tell you this because I know it can be difficult to trust sponsored reviews. Most people are NOT dishonest when writing them, but it’s still difficult to see these articles as being genuine. I will share below my journey with the Ollie swaddle. 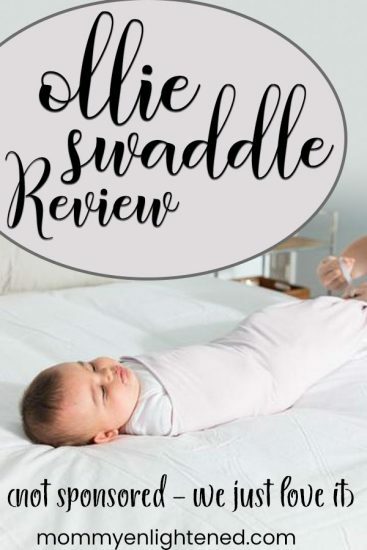 I feel like the whole picture is important to do an accurate Ollie swaddle review. The first time I watched a YouTube video of a nurse swaddling a baby with a receiving blanket, I knew I was going to have to figure out an alternative. I am good at a lot of things – putting a human into a straight jacket has never been one of them. That meant I needed to pick up something a little fancier than a regular ol’ baby blanket. I had never heard of the Ollie swaddle before we received one as a gift from my sister at our baby shower. We had to go through a few (as in TEN other swaddles…and I am not exaggerating) swaddles before finding and becoming loyal to our Ollie. We got more use out of this swaddle than we did any other baby product we purchased, so I felt like I should probably write an Ollie swaddle review (seeing as how we are kind of experts haha). We will go over some of the pros and cons of the Ollie swaddle below. No product is perfect, but I feel like this swaddle came pretty close. Before we get into the things I love about Ollie – here is a link to the Ollie website (and my fav swaddle). There you can learn more about the company and (maybe) get one of your own! I think “simple” things put some people off (especially when the product is expensive!). I get that – but when it comes to your swaddle, simpler is better. The Ollie is literally a rectangular piece of stretchy fabric with a huge strip of hook and loop (Velcro-like material) going down one side. There is also a little band toward the bottom to help keep your baby enclosed. That’s it. When you are trying to survive the first few weeks after baby is born, you should make it as easy on yourself as possible. The Ollie swaddle is easy enough to use you could do it with your eyes closed (or in the dark which was frequently the case for us). Some would argue that MOST swaddles are easy to use. While this is true, most swaddles aren’t THIS easy. Many swaddles are made with stretchy material, but the Ollie was my favorite. It’s incredibly soft but elastic, which allows for SOME movement, but not too much. One of Ollie’s selling points is that they use moisture-wicking materials (fabric used in sportswear). This helps your baby thermo-regulate against heat AND cold. We will talk more about this later. A hook and loop provide ease of use that other swaddle materials just don’t. The problem with it is it seems to wear out after five or six washes, which means you are either going to own a stinky swaddle or have to purchase a new swaddle over and over again. This isn’t the case with the Velcro-like material used in the Ollie swaddle. The huge strip of Velcro works really well, and we never had ours wear down (even after twenty or thirty washes). The Ollie swaddle I purchased came in a pretty box (with cute woodland animals on it), with a thank you card and a small laundry bag. I am not sure that they still include the laundry bag, as I never used it with either of my kids. While this personal touch is nice, it wasn’t a selling point by any means. I just thought I would add that because I know that some people would really appreciate the thoughtfulness that goes into the packaging. Notice how the hook and loop (like Velcro) is listed as both a positive AND a negative? I had a love-hate relationship with the thing. If we ever needed to adjust it during the night (because that sometimes happens with ALL swaddles), our baby would be rudely awakened by a loud RRRRIIIPP noise from the swaddle. It rarely needed to be removed while she was sleeping – but it’s something to keep in mind. The Ollie swaddle is EXPENSIVE. It’s probably one of the most expensive things we purchased for our babies. It feels a little ridiculous – especially considering how simple the design is. I am not sure how they justify the cost (I really don’t – maybe the material it’s made from is THAT fancy). Honestly though..something that will get your baby to sleep is WORTH it. As I said earlier, we tried multiple swaddles with our babies. If I am being totally honest, I actually forgot about the Ollie swaddle with my first until we were home from the hospital…for a week. We had tried multiple good brands, such as a Halo SleepSack, the Miracle Blanket, the SummerMe Infant, and the SwaddleUp. They all had their own set of issues, with the biggest being our baby was able to shimmy her way out of most of them. She did not like having her arms swaddled up (the SwaddleUp swaddle), and the hook and loop on others wore down quickly after a few washings. I think the bottom line to this Ollie swaddle review is that regardless of its cons – it’s the ONLY swaddle that actually worked AND was easy to use. The only one. If you are sold, you can purchase one here. Otherwise, keep reading on. A big question I get asked is how does the Ollie swaddle compare to the Miracle Blanket? It really depends on your baby. If your baby is a miniature Houdini (like both of my children have been) the Miracle Blanket may not be enough to keep them restrained. I purchased two of the Miracle Blankets, as a friend of mine really likes hers. I got two different color patterns and found the texture of the two blankets were quite different. One was soft, the other felt more scratchy. One was stretchy, the other one seemed much stiffer. Although MOST people are perfectly happy with the Miracle Blanket, this was enough to turn me off of them. When comparing the Ollie swaddle vs Miracle Blanket, some of it comes down to personal preference. I found the Ollie to be easier to use and more breathable, but the Miracle Blanket doesn’t use a hook and loop (so it will be much quieter overall). Now that we have our Ollie swaddle review out of the way, here is some of the more general info regarding the Ollie. Although an Ollie swaddle review doesn’t NEED a how-to section, I thought it would be beneficial to share how it works. Again, the Ollie swaddle Is literally a rectangle – so it’s not too difficult to figure it out. Step 1: Put your baby into the middle of the swaddle with their shoulders slightly above the top of the Ollie. This is important – as it helps ensure that the fabric won’t bunch around the neck. Step 2: If swaddling arms in, pin both arms down (I swear it’s not as bad as it sounds!) and fold the first side of your Ollie tightly over the left arm and torso. Tuck it over and behind your little one’s right arm. Step 3: Now both arms should be tucked in. Take the second side of the Ollie and attach it to the hook and loop closure. Step 4: Secure the elastic loop directly under your baby’s feet. The sizing on this is flexible, so it will grow with your baby. HOW DO YOU CLEAN AN OLLIE SWADDLE? We purchased a brand new Ollie swaddle for our second daughter, which arrived in the mail when she was two days old. The first time we put it on her, she pooped all over it – and yes, it was the black newborn poops of death. I immediately went online and purchased a new one, as I was SURE the poop wouldn’t come out, and then proceeded to try and wash it. According to the Ollie website, the correct way to wash one is below. First, secure the hook and loop tabs and put the Ollie swaddle into a mesh laundry bag. Wash the Ollie on the delicates cycle in cold water with baby detergent. For drying, either air dry or tumble your Ollie on a low or no heat setting. I KNEW that wasn’t going to cut it with the disgusting black poops. I didn’t secure the hook and loop because it was covered in poop. I instead hand-washed the Ollie in our laundry sink in warm water. I let it soak than scrubbed at the hook and loop snaps. Once I had thoroughly scrubbed it, I crossed my fingers and washed it according to the instructions. It worked. The stains came COMPLETELY out. Also, my scrubbing of the hook and loop did not affect the stickiness of the Velcro-like material (another reason for my positive Ollie swaddle review). I wouldn’t recommend doing it my way – but I didn’t have a choice. I very much planned to throw it straight in the garbage if it came out poop streaked. WHAT SHOULD MY BABY WEAR UNDER AN OLLIE SWADDLE? 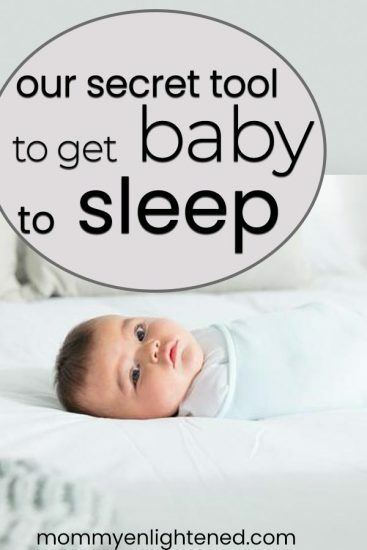 This is dependent on what temperature the room is that your baby will be sleeping. Talking with your pediatrician is your safest bet. HOW MANY OLLIE SWADDLES DO I NEED? You only need one swaddle. Having more than one is much more practical, however. Since your baby will be napping at different points throughout the day, it may be tricky to try and make sure you have a clean swaddle ready for nap time if you only have one. For us, two was the perfect amount. WHO IS AN OLLIE SWADDLE NOT FOR? I think an Ollie swaddle is for anyone who has a newborn baby, but I also understand they come at a steep cost. Will other swaddles do the trick? Sure – usually. If you want a swaddle that you know will be easy to use, and that will keep them from wiggling out, an Ollie is the best recommendation I can make. I understand not being able to afford one. It’s worth looking for an Ollie second-hand (we sold ours on eBay), as they usually hold up for a long time. We sold ours for half of what we originally paid for it ($30), which is much closer to the price point of other swaddle brands. There are a few general swaddling safety rules that apply for all swaddles – not just the Ollie. Swaddling (arms in) becomes unsafe for your baby once they can roll over on their own. Although most babies don’t roll until they are around four months old, some roll as early as two months old. CAN I USE AN OLLIE SWADDLE ARMS OUT? Yes, you can use the Ollie swaddle with one or both arms out. The application is the same, only without the arms being pinned down. Once your baby is old enough to begin rolling, it’s time to transition them to arms out. Luckily, it’s pretty difficult to make an Ollie swaddle too tight (the same is true for most stretchy swaddles). According to the American Academy of Pediatrics, parents often worry needlessly about a swaddle being too tight, and it’s more likely that they will swaddle too loosely. An easy way to tell if the swaddle is too tight is to slide your hand in between the swaddle and your baby’s chest. It should feel snug -similar to how it felt to slide your hand between your pregnant belly and the elastic waistband of your pants at the end of your pregnancy. I hope this Ollie swaddle review was helpful in guiding you toward whether an Ollie is a right call for you. The best swaddle may vary from family to family, but I truly believe you can’t go wrong with an Ollie.